The mobile launcher was returned to its park site beside the Vehicle Assembly Building in November 2011 following checkouts at Launch Pad 39B at NASA's Kennedy Space Center in Florida. The results are in and multiple sensors showed that NASA’s 355-foot-tall Mobile Launcher reacted as expected during its move to Launch Pad 39B in November 2011. Engineers were testing to see if the if the structure and crawler would be up to the challenge and stated that the actual results varied less than 5 percent from the predicted computer models used in designing the ML. 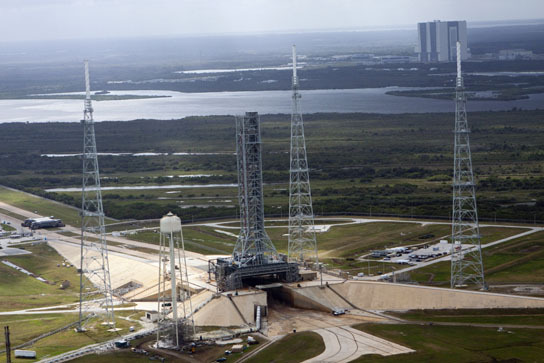 The 355-foot-tall Mobile Launcher, or ML, behaved as expected during its move to Launch Pad 39B in November 2011, an analysis of multiple sensors showed. The top of the tower swayed less than an inch each way. “I would think you would have perceived it,” said NASA’s Chris Brown, the lead design engineer for the ML. The tests showed that computer models used in designing the massive structure were correct. The actual results varied less than 5 percent of what was predicted. The computer models for the launch support structures and the models for the Space Launch System rocket the ML will work with will be used together to fine tune both designs. The mobile launcher as it stood at Launch Pad 39B. Note the Vehicle Assembly Building in the background. 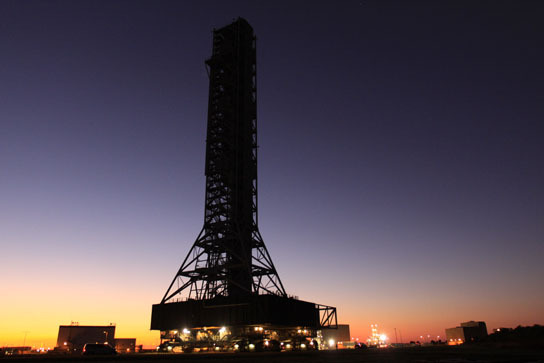 Engineers had the tower wired with dozens of accelerometers and strain gauges along with wind sensors to record the launcher’s movement during its slow ride atop a crawler-transporter from a park site beside the Vehicle Assembly Building to the launch pad. The ML is expected to make the same trip numerous times during its career as the support structure for NASA’s Space Launch System, or SLS, a huge rocket envisioned to launch astronauts into deep space. The move and testing was planned to show designers whether the structure and crawler would be up to the challenge. Crawler drivers performed several speed changes during the six-mile journeys to and from the pad. While at the pad, which is being refurbished after decades of hosting space shuttles, workers connected ventilation, fire support and alarm systems and other water lines. The instruments used in the testing are very precise, accurate enough to record even the most subtle of vibrations and movements. “We were measuring milli-g’s,” Brown said. The readings will also be used for determining how fast the crawler will be allowed to go as it carries the rocket to the launch pad. For instance, there is substantial vibration at 0.8 mph, so engineers want drivers to stay away from that particular speed, but that does not necessarily mean the crawler will be ordered to slow it down. The ML, designed for the Ares I rocket of the cancelled Constellation program, is due for major modifications in the coming few years as it is strengthened to support the much-heavier SLS. It took two years to build and was completed in August 2010. A structural design contract is expected to be awarded this year and a construction contractor in 2013. Umbilical arms reaching from the tower to the rocket are scheduled to be installed in 2015. The ML is the biggest structure of its kind since the Launch Umbilical Towers were constructed to support the Apollo/Saturn V. Those towers saw numerous modifications through their lives as trial-and-error showed where changes were needed, Brown said. “Our goal here is to have less of those kinds of problems,” Brown said. Computer models were also used when NASA designed the Apollo towers, but those models were much simpler than today’s versions simply by virtue of the computing power available now, Brown said. “We can run in five minutes what would have taken them days to run,” Brown said. Be the first to comment on "NASA Mobile Launcher Reacted as Expected During Move to Launch Pad 39B"